EAT NEW AND TASTY THINGS. Meticulous Pick Lists We know consistency is critical, so when you need fifty nasturtium leaves, quarter-sized, we can help! Last Minute Orders Feel free to text us in the morning, and we’ll get you your hop vine tips in time for service! Farm Walks & Custom Orders Send your staff to the farm to select the very best each season has to offer. We started growing so we could get things we couldn’t find anywhere else—and now you can get them too! Nettle Grove Farm is a 5 acre homestead and market garden on the Kitsap Peninsula. We grow specialty produce for the discerning chef & food enthusiast. Our mission is to showcase unique varieties with the very best flavors and textures. Whether we're growing rare Eastern European tomatoes, vibrant specialty peppers, or heirloom beans passed down for generations, we grow the ingredients that will have the greatest impact on your finished dishes. We've turned what was once a grove of nettles into productive gardens that make the most of our property's challenges. Our philosophy is to work with the land, not against it. We pull techniques from many different farming methods to get the most out of our space while minimizing the impact on the soil and wildlife. Ashley started working on farms after having narrowly escaped a job in a secret basement laboratory (this is an exaggeration; it wasn't actually secret). Volunteer work teaching people to grow food inspired her to make it a full-time gig. 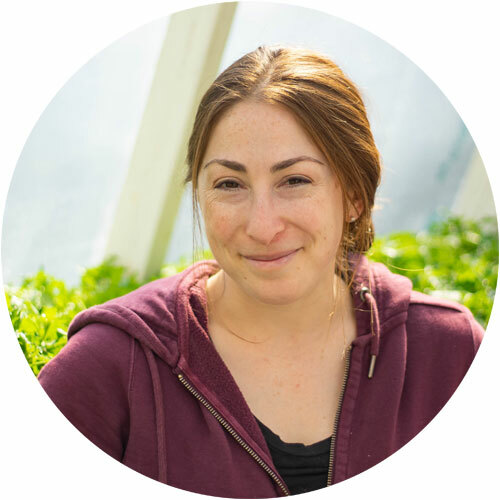 Thus began her quest to learn from the best and brightest.After a few years at The Herb Farm Restaurant in Woodinville and other local farms, she moved to Kitsap County to start new adventures and spread the love. Yes, some people show love with vegetables.